At one time, there were over 5,700 wooden elevators in Canada's prairie provinces. Called prairie giants or sentinels on the prairies, they handled the grain that helped make Manitoba, Saskatchewan and Alberta a bread basket for the world. And not only that; the elevators were the social hubs for the area’s farmers, a place to not only take a load of grain, but also to grab a cup of coffee and catch up on the local news. For residents of those town, the loss of the elevator was more than just economics—it was a real punch in the gut. It said the town was dying, or soon would be. Those classic old elevators have mostly been replaced by modern concrete throughput elevators—giant facilities that can handle large strings of hopper cars and hold many more bushels of grain. Today there are only 500-600 left, by one estimation, and only half of those are in operation. 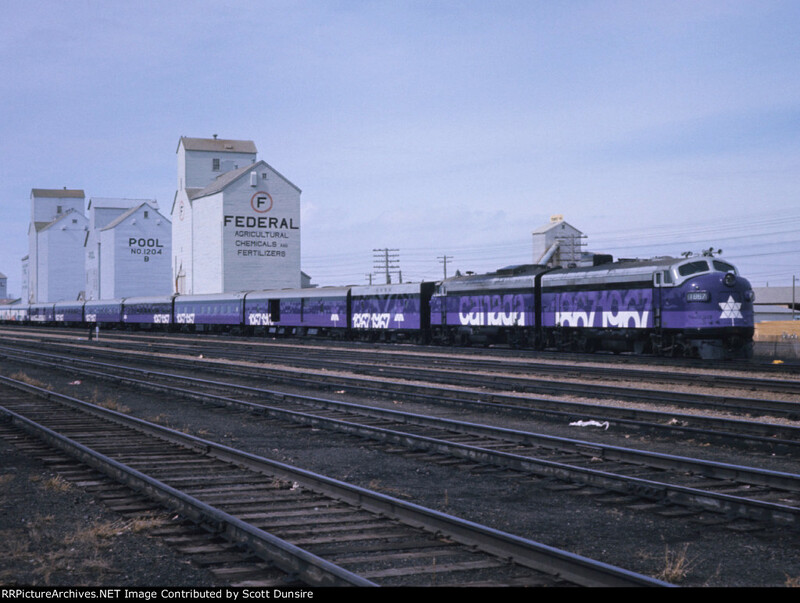 The most recent one to be destroyed was at Meadows, just to the west of Winnipeg on the CPR mainline. 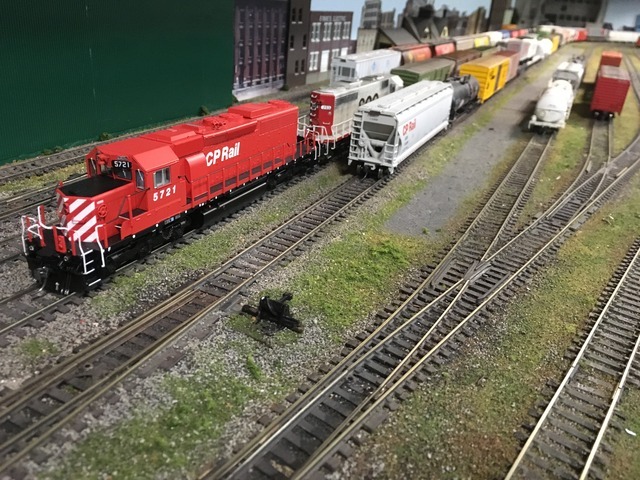 For Canadian Railway Modeller Morgan Turney, its destruction is yet another sign of changing times. He wrote to following ode to the Meadows elevator. I don't know what it is about the name 'Meadows;’ perhaps it conjures up memories of a very peaceful place. There isn't much there. A few farms nearby and a homestead just across the street from the Meadows road sign. But it had a Paterson wooden grain elevator, the first one you came across driving westward down Rosser Road. Rounding a gentle curve just past Rosser, there were two things you could count on seeing. One was an African-type tree (it looks like it's from the plains of the Serengeti) in the field on the right hand side of the road. And in the distance straight ahead, the Meadows elevator. It served as a familiar landmark to anyone taking the back roads and following the CPR's Carberry subdivision on a railfan adventure toward Portage la Prairie. Sadly after July 20, 2017, that 'African' tree is all that's left. Many of us will miss the Meadows elevator. It was the last one standing on that route after Marquette (another Paterson elevator) was pulled down on September 3rd, 2013. How sad is it that we destroy our iconic history so willfully. So thoughtlessly. Meadows is gone—forever. All that's left are the photographs. As Canadians, we aren’t used to Americans noticing us. We’re like the nice people in the apartment upstairs who are quiet and never make a fuss—easy for the people downstairs to ignore. So when Americans do take note of us, we are both proud but also little embarrassed by the attention. We’re Canadians, after all—saying “sorry” is our national pastime! 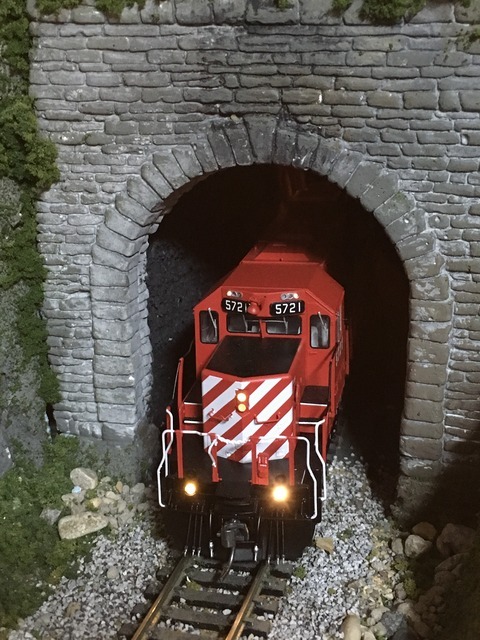 One place where Canada has been getting some attention from the U.S. recently is in the model railroad world. In HO scale, American manufacturers Athearn, Atlas, Bowser and InterMountain have all been making Canadian prototypes. It’s an embarrassment, alright; an embarrassment of riches. 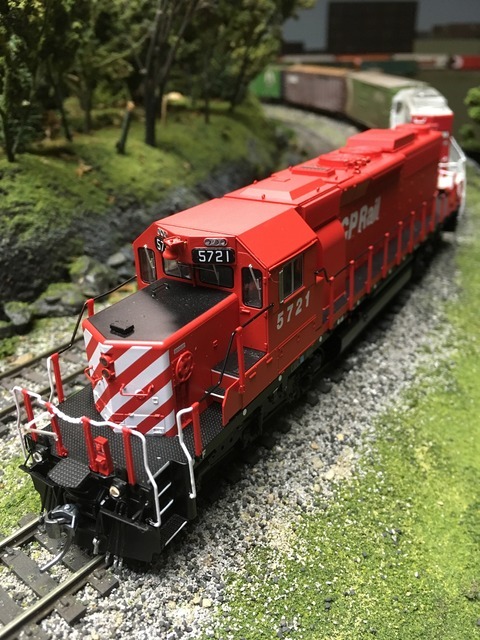 Of the four, it is Bowser which has taken the deepest plunge into the Canadian market with its HO scale Canadian locomotives. In 2015, I asked Bowser rep Scott Davis why that was. Back then, he said it was partly because the Canadian economy was doing much stronger than the U.S. economy at that time—so why not take advantage of it? 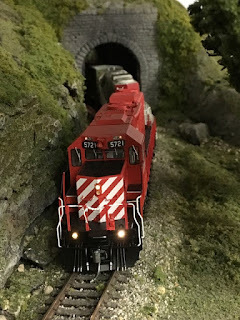 Things have evened out since then, and still Bowser is making Canadian models such as the C-630M, M636, RS3, SD40-2, SD40-2F (Red Barn), and the SD40. 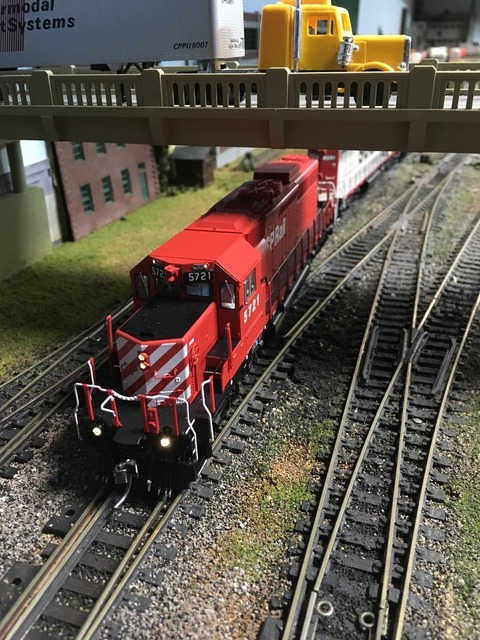 Bowser owner Lee English confirmed the GP38-2 and GP9u in an e-mail this past week. The CP version of the GP38-2 will be measured this month, he said; Bowser has already measured the CN version. The unit will go to the designer by the end of the summer. As for the GP9u, it was also measured recently. There is no date yet set for when it will go to the designer. Bowser also plans to make a slug. Intrigued by all this emphasis on Canadian prototypes, I asked Lee what causes him to continue to make models for this market. A main reason, he said, was the great support from Canadian model railroaders—both in offering advice and ideas during the design stage, but also in buying the products. 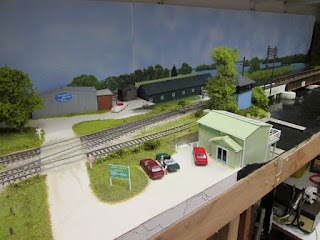 When designing a model, Lee sends out an e-mail to Canadian modellers for help. As for sales, “the SD40-2 has been a very good project,” he says, and it has led him to consider other Canadian models. It also helps that he employs, or has employed, staff who like Canadian railways. Rich's job is to research potential models that Bowser could make—models not being made by others. 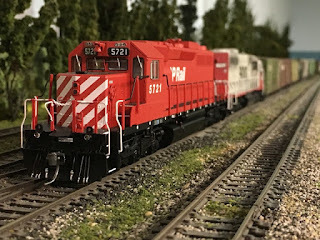 Knowing that a lot of Canadian model railroaders would likely want a 4-axle locomotive made the decision easier. I finished my questions by asking Lee what it he wished model railroaders knew about the life of a small model railroad manufacturer. If they see a new announcement, “offer to provide info,” he says, adding they should be sure to provide photos or other documentation. Those of us who are Canadian, or who model Canadian railways, are glad he will. 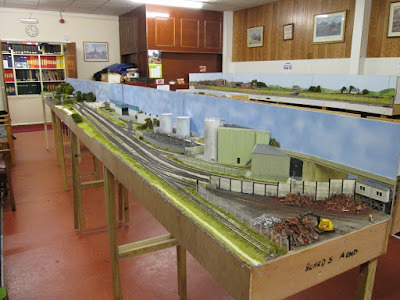 In 2013 I wrote about a Great Canadian Model Railroad in England—Chris Round’s Stoney Hill Yard. Chris is at it again. 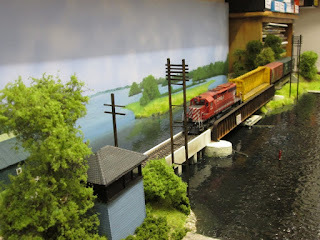 He has built another portable layout based on a Canadian prototype: The Atherley Narrows. 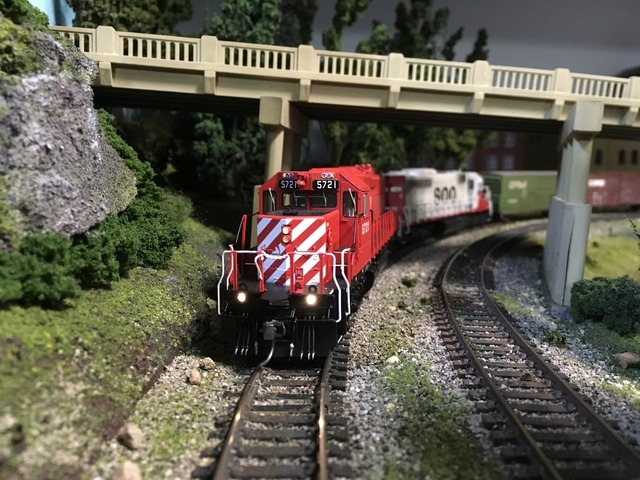 Like Stoney Hill Yard, Atherley Narrows is also HO Scale and also features CP Rail in the 1990s. 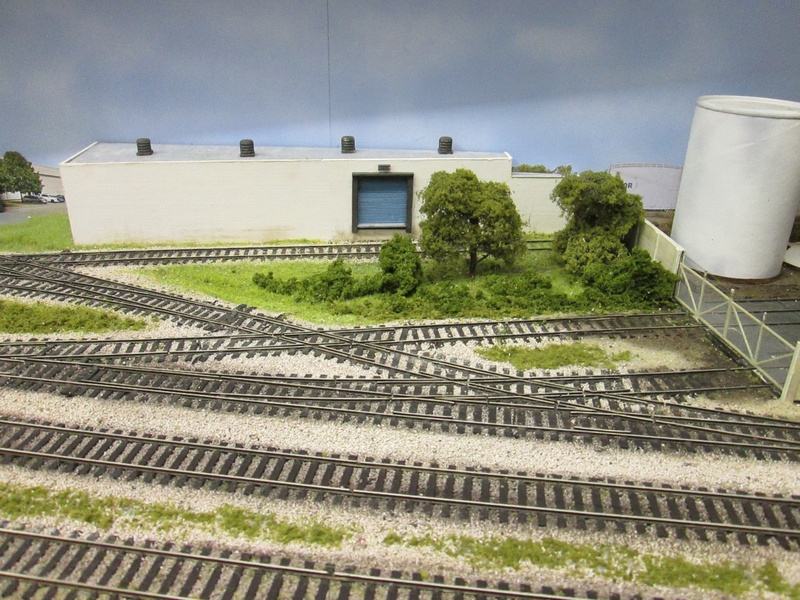 Although Chris’ previous layouts successful and well-received at exhibitions, he wanted to build a better layout and remove some of the irritations with previous plans. This included how operations on Stoney Hill were limited since all the industries were accessed off the main line—through trains could not be operated at the same time as industries were being switched. The track plan allows for the seven industries on the layout to be served from loops off the main. 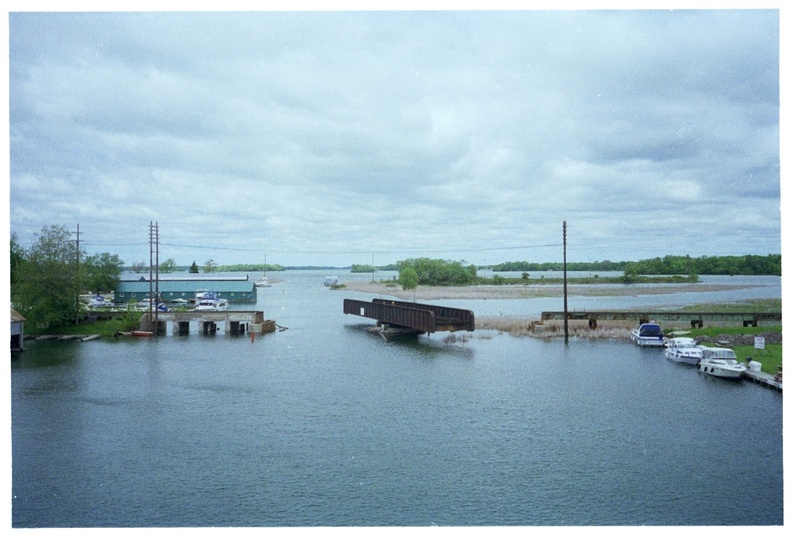 For inspiration for the new layout, Chris used a photo he had taken in 1994 of a swing bridge at Atherley, Ontario, at the confluence of Lake Simoce and Lake Couchiching near Orillia. The bridge was already out of use when he took the picture, and was a CN line, not CP Rail. Not being a stickler for absolute authenticity, Chris was willing to pretend CP Rail owned it. His initial thought was to build a simple diorama of the bridge and its approach piers, but he then decided to build something grander. 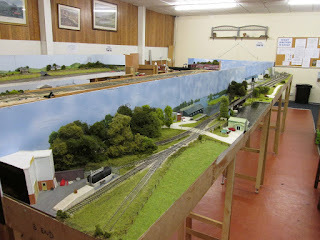 The layout is 20 feet long and 8 feet wide when set up. Individual modules are 4 feet by 18 inches wide. The modules (which the British call “baseboards”) are made of plywood. 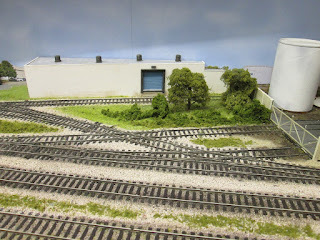 Track is Peco code 75 rail and all switches and crossovers are handlaid. The switches are hand operated by rods attached to electrical switches at the rear of the layout. Control is old fashioned DC. “I’ve too many old locos to convert to DCC and I can’t afford the cost of the better sound equipped new locos which are available,” says Chris. As for the swing bridge itself, the base is a metal shelving bracket and the bridge is constructed from plastic. And, yes, it pivots! The layout is not yet complete, Chris says; the edges of the boards need painting, details need to be added and a lighting unit and upper fascia needs to be built. Even then, it looks great to me—it surely is already another Great Canadian Model Railroad! Alpha and Omega on the M & M Sub. 2017 marks 30 years since I got back into model railroading. 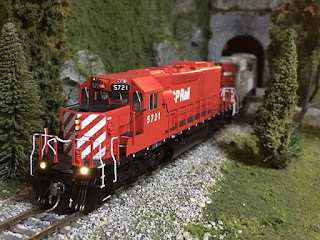 I had liked trains my whole life up to that point, starting with Lionel as a kid before moving to Tri-Ang, HO, and then N scale. I sold my N scale stuff in 1976 before heading off to university and a more unsettled life that took me to Manitoba, B.C., Europe and Texas. 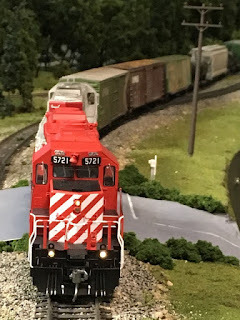 It was in Texas, in 1987, 11 years later, when I got back into the hobby. I had $50 to spend on some trains before returning to Manitoba. 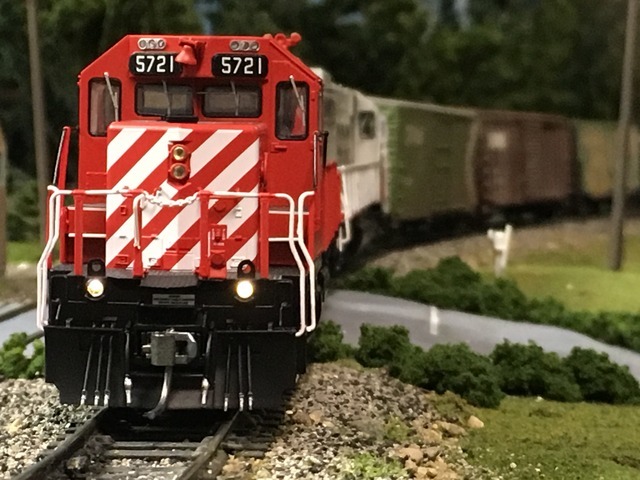 I bought a locomotive and eight or nine freight cars—yes, for only $50 (you could do that back then). Of those items, only one piece of rolling stock remains on the M & M Sub. 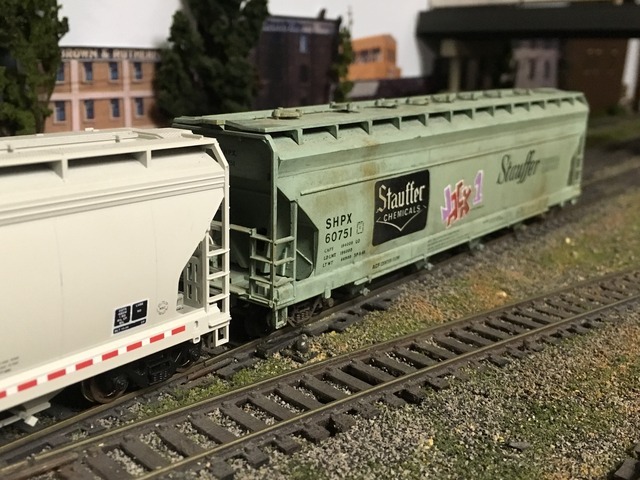 : SHPX 60751—Stauffer Chemical Company. The others were sold or "scrapped." In the Greek alphabet, alpha is the first letter, and omega is the last one. So SHPX 6071 was among the first of my current model railroad possessions, and also the last from that time. And it is also the last in line on DUL-WPG MX (Duluth-Winnipeg Mixed) on this July day, 30 years later. Sometimes I want to write a post; other times, I just want to share some photos. This is one of those times—a bit of railfanning on the M & M Sub. 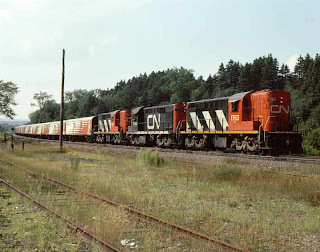 Come along as I follow a train from Fort Frances, Ont. to Nance, Minn. Thanks for coming along for the trip . . . . 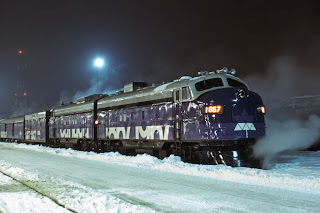 The Confederation Train; photo by Jim Brown. I originally published this post in 2013. On the occasion of Canada's 150th anniversary, it seems appropriate to post it anew. 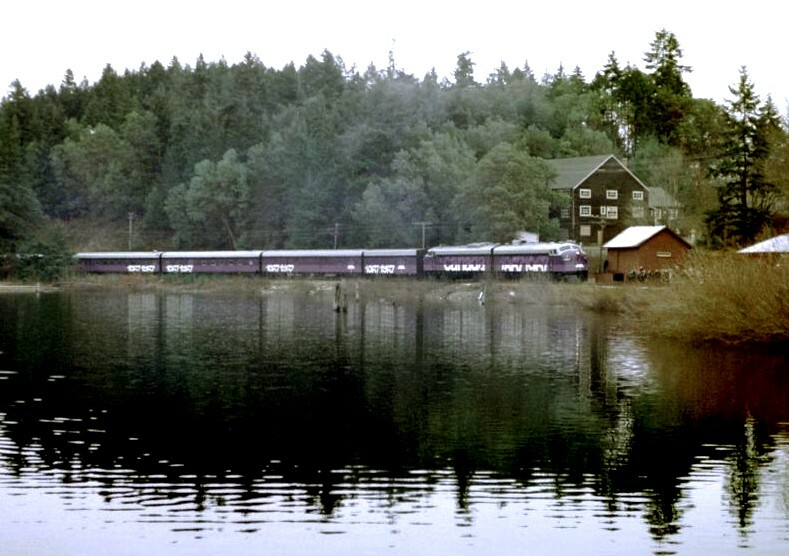 Forty-six years ago, in 1967, a special train crossed Canada--the Confederation Train. 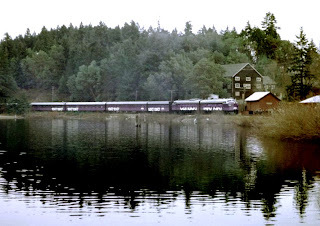 The train, made up of two FP9A locomotives (numbers 1867 and 1967) and eight colourful cars, was a travelling exhibit about Canadian history. 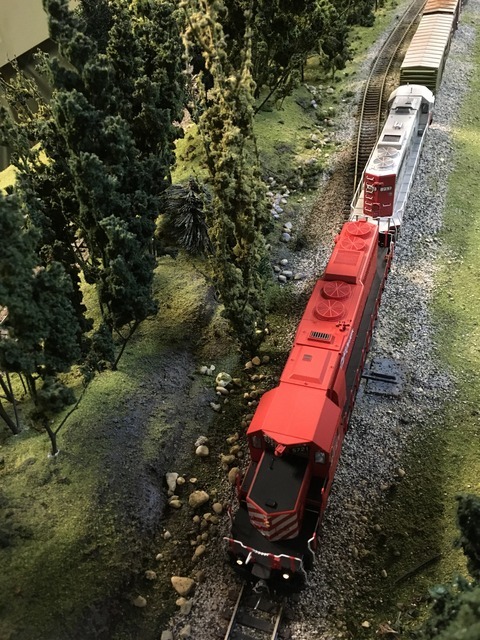 The train made its public debut in Victoria, B.C. on January 9, 1967. It arrived in Atlantic Canada in October, and ended its journey in Montreal in December of that year. 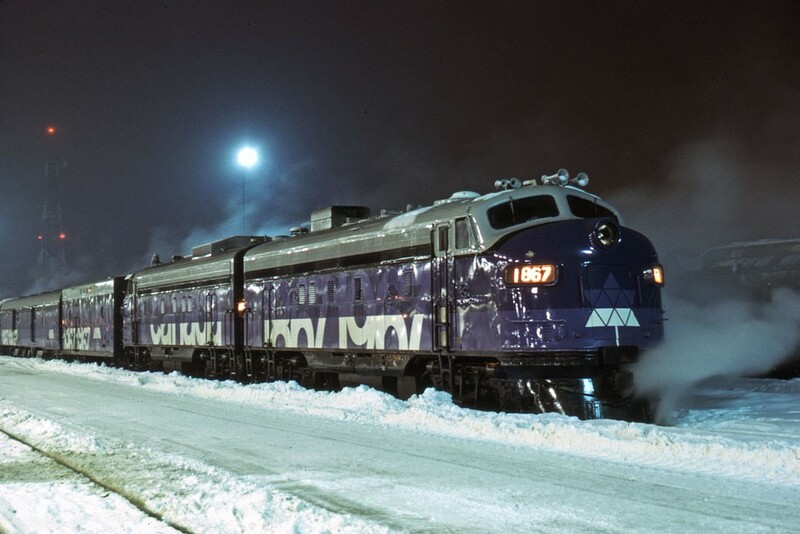 During its tour, it stopped at 60 cities and towns, and was visited hundreds of thousands of Canadians. In Swift Current, Sask. ; Scott Dunsire collection. 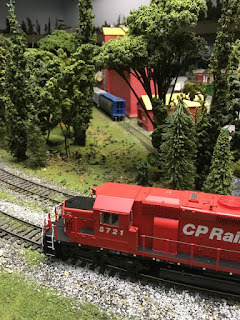 Modeller Fred Barkhouse was so enamoured of the train that he decided to make a model of it--something he described in Canadian Railway Modeller. 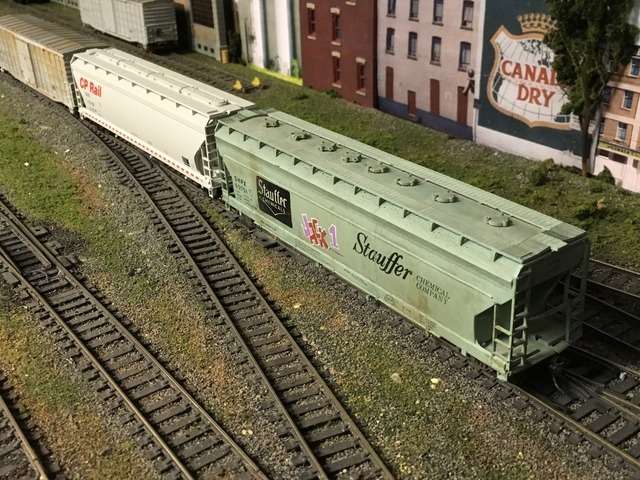 Fred's inspiration for the project came from a Lionel HO scale train set called the Confederation Flyer that was owned by his father. The train set had a locomotive, ten 50-foot boxcars and a caboose; each boxcar was painted for a province with their flag and the date they joined Canada. Since Fred made his train before InterMountain brought out its units in Confederation Train colours, he used Highliner F9 shells on Athearn Genesis drives for the project. 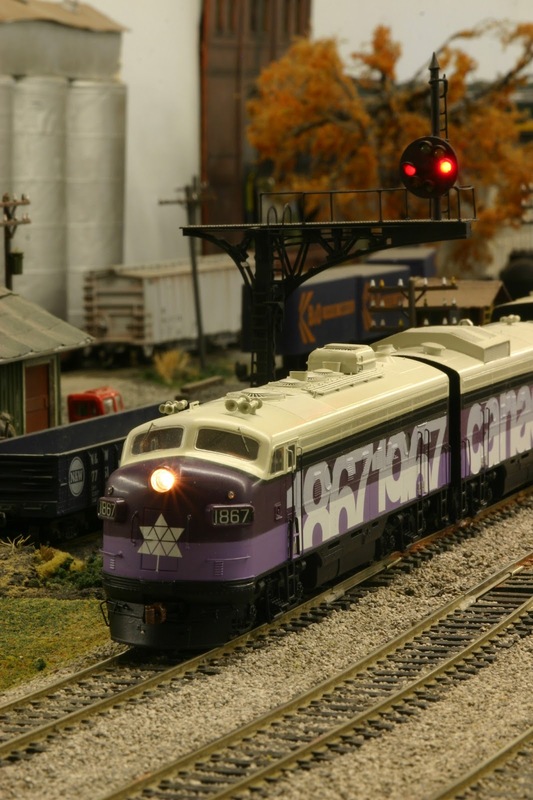 The cars were made from Rapido Super Continental passenger cars. 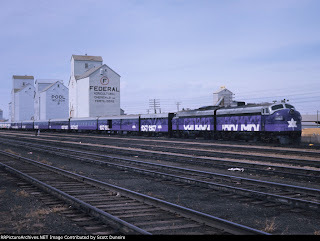 See videos of Fred's Confederation Train on YouTube here and here. Read more about the prototype train and see more photos here.